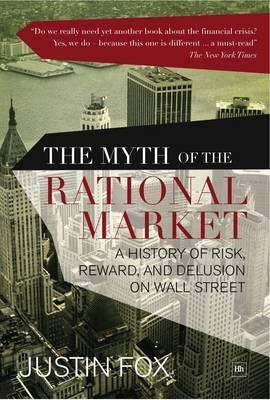 Chronicling the rise and fall of the efficient market theory and the century-long making of the modern financial industry, Justin Fox's "The Myth of the Rational Market" is as much an intellectual whodunit as a cultural history of the perils and possibilities of risk. The book brings to life the people and ideas that forged modern finance and investing, from the formative days of Wall Street through the Great Depression and into the financial calamity of today. It's a tale that features professors who made and lost fortunes, battled fiercely over ideas, beat the house in blackjack, wrote bestselling books, and played major roles on the world stage. It's also a tale of Wall Street's evolution, the power of the market to generate wealth and wreak havoc, and free market capitalism's war with itself. The efficient market hypothesis - long part of academic folklore but codified in the 1960s at the University of Chicago - has evolved into a powerful myth. It has been the maker and loser of fortunes, the driver of trillions of dollars, the inspiration for index funds and vast new derivatives markets, and the guidepost for thousands of careers. The theory holds that the market is always right, and that the decisions of millions of rational investors, all acting on information to outsmart one another, always provide the best judge of a stock's value. That myth is crumbling. Celebrated journalist and columnist Fox introduces a new wave of economists and scholars who no longer teach that investors are rational or that the markets are always right. Many of them now agree with Yale professor Robert Shiller that the efficient markets theory "represents one of the most remarkable errors in the history of economic thought." Today the theory has given way to counterintuitive hypotheses about human behavior, psychological models of decision making, and the irrationality of the markets. Investors overreact, underreact, and make irrational decisions based on imperfect data. In his landmark treatment of the history of the world's markets, Fox uncovers the new ideas that may come to drive the market in the century ahead.